How can a Health Coach help? Why is Primal any different to other diets? > Smoothies can make it very easy to eat (drink?) a lot of sugar (yes, it’s natural sugar – mostly fructose – but this can still be problematic for the body to handle in large quantities). At least smoothies contain the fibre from the fruits – unlike juices, which concentrate the sugar without the beneficial fibre – but Primal-aligned smoothies contain a little less fruit and more fat and protein through additions such as full-fat yoghurt, coconut milk/cream/oil, avocado, seeds, etc. Smoothies can in fact be a useful way to hide these filling, nutrient-dense ingredients, as well as nutrient-dense greens, such as baby spinach, for people who don’t like the taste of such things on their own. The key, for me, is to watch that smoothies are not just a glass full of sugar. 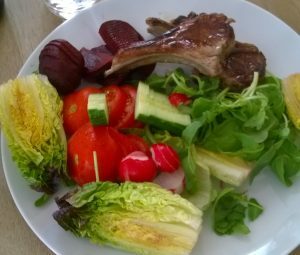 > Primal eating means basing at least one meal a day on a plate full of vegetables, often with a variety of types and colours, so that we get a good selection of health-giving antioxidants and other wonderful nutrients from things that grow. But, these essential vegetables, ‘superfoods’ or not, are turned into a more satisfying and nutritious Primal meal with the addition of some quality protein and fat. See Mark Sisson’s Big A## Salad: Salad adventure; Mark’s 2017 ‘keto’ salad . I keep a selection of things in the fridge – a bag of rocket, a bag of baby spinach, a cucumber, tomatoes, radish, mushrooms, whatever – ready to throw into a bowl and top with tuna, or leftover chicken, or olives, or chunks of feta cheese and then drizzle with apple cider or balsamic vinegar and olive or avocado oil. This kind of meal is designed to keep blood sugar levels evenly balanced, fill us up, and exploit the power of fat to improve our absorption of nutrients from vegetables (oil- or egg-based dressings for salads, as well as butter melted onto vegetables, are not traditional pairings for nothing!). > When Mark Sisson was asked last year what he thought about ‘superfoods’, he pointed out that his superfoods would include things like liver, egg yolks and wild salmon, as well as common foods such as onions and garlic. It is interesting to see just how nutrient-dense some basic foods are — foods that are a lot less exotic than the ones touted in the media — and they are certainly not all fruits and vegetables. The U.S. Department of Agriculture provides a national nutrient database and I plan to group together some nutrient figures from this for a future post on some common Primal foods. In the meantime, if you are interested, take a look at Zoe Harcombe’s discussion on this topic. The Primal Blueprint’s focus on meat, fish, poultry, eggs, nuts, seeds, vegetables, fruit and healthy fats allows lots of room for individuals to shape their meals to suit their personal tastes, tolerances and cultural traditions. The key is unprocessed, nutrient-dense foods – which foods people choose within this framework might vary wildly. Someone asked me what my top ten superfoods would be and I came up with the list in the table below. If you were looking to include more unprocessed, nutrient-dense foods in your life, what would your personal top ten superfoods look like? Scrambled, boiled, omelette, fried, poached. Tinned boneless sardines, smoked mackerel, salmon fried/baked/smoked. Anchovies grilled on lettuce(!!) Haddock. Roast, minced, stew, stir fries. Bacon/salami/chorizo/paté. Drumsticks/thighs/steaks/chops. Lettuce, rocket, spinach, broccoli, brussel sprouts, cress, red/white/green cabbage, kale, chard, asparagus, courgettes. Peppers, sweet potatoes, potatoes, tomatoes, carrots, beetroot, parsnips, cucumber, red/brown/spring onions, mushrooms, cauliflower, butternut squash, swede, garlic, ginger, herbs and spices. In half with salt, pepper and vinegar; mashed with spicy Mexican food; in guacamole; in smoothies. Almonds, pecans, macadamias, walnuts, cashews, brazils. Ground almonds in baking. From a jar in brine usually; sometimes in a pot in oil. Fats (unrefined, heat/air/light-stable): olive oil, coconut oil, goose fat, butter, avocado oil. Used to cook with. Olive oil or avocado oil on salads or in home-made mayonnaise. Full-fat plain yoghurt, cheese, fresh cream, sour cream. 85% cocoa chocolate; 100% cocoa in baking; coconut butter; berries, apples and other fruit; limited dates, honey or maple syrup in baking. Everyone tells you their diet is The One. If you only follow their instructions then you will be thin/healthy/happy/perfect, etc. Popular British newspapers feature a never-ending parade of diets that will supposedly transform your life. There is, no doubt, room for all kinds of diet, considering that the world has all kinds of people. And yet, many people have tried so hard to lose weight and get healthy but struggle to get anywhere. Or they lose weight and then put it back on again later. Why do I think Primal can be any different? Yes, it takes willpower to switch over to primal. Cleaning out the pantry, re-stocking with primal foods, and planning what you will cook takes some thought and effort. But willpower becomes less important even after a few weeks because, crucially, primal-aligned foods keep you fuller for longer. This is important because, as many of us know, losing weight is easier than keeping the weight off long-term. Willpower is great until you just can’t keep it up anymore! Our bodies eventually just want to make up for the ‘famine’ and get some food on board. This is why we try not to call Primal a ‘diet’ – it is designed to be something that more people can sustain forever. tend to be naturally low in carbohydrates and therefore make it easier to keep insulin levels low and stable as described above. provide our bodies with the nutrients we need, helping to remedy some of the deficiencies we may have built up over the years and helping us to feel satisfied. contain the natural fats that can be used for vital functions in our bodies, help us absorb nutrients, contribute to stable insulin levels, and keep us full for longer. exclude many damaging foods that deplete, irritate or overwork our bodies. form the basis for specialist diets designed to heal all sorts of chronic conditions (the Wahls Protocol and the GAPs diet come to mind). Many kinds of diet will contribute to health and weight management. What successful diets have in common is that they encourage the reduction of sugar and processed food. Primal goes further by also reducing less obvious sources of sugar (such as starch-based grains) and in focusing on the all-important nutrient-density. Of course, Primal is just another diet option among many but I think that anyone who is wondering why they are not losing weight even though they are not over-eating or who has lost weight only to put it back on again will instinctively know that there has to be more to losing weight than just trying to eat less and do more exercise. Are you an all-or-nothing person? When health coaching, one of the first things I like to know about a client is whether they are someone who likes to jump in at the deep end in life or whether they are a one-step-at-a-time kind of person. The Primal Blueprint offers a simple 80/20 rule: if you eat well 80% of the time, then it won’t matter too much if you ‘go astray’ for 20% of the time. For many people, this means that they can ease into new ways of eating and just aim as high as they can, with no worries if they don’t change everything at once. It means that if you really need that piece of toast to go with your eggs at breakfast, then don’t let that knock you off course, just try not to fill the rest of your day with non-primal foods. It doesn’t mean only aiming for 80% – it’s more about aiming for 100% but being very happy with 80%. I know people who work very well with this concept. Sugar in your cup of tea? Why not, it’s only a teaspoonful and it might be very important for your morning routine or general relaxation. Primal living is, above all, about getting the most enjoyment out of your food and your life. In the scheme of a fairly primal way of eating and living, that teaspoonful doesn’t amount to much. It’s a perfect roadmap for many people, allowing them to create their own framework of eating and knowing that they can be relaxed about certain foods that are not considered ‘primal-aligned’ but which are important to them. The 80/20 rule can also be used as a transition crutch: swap some foods for primal-aligned foods but keep some others, aiming eventually for a greater percentage of primal-aligned eating. I am a great believer in food swapping – I did this inadvertently when I gave up desserts and milk chocolate. I knew I always went hunting for snacks in the evening, so I had some full-fat yoghurt and oat cakes to hand. I hadn’t come across the Primal Blueprint at this time so I didn’t know that oatcakes weren’t ideal, but they provided a good transition away from sweet treats. It’s great when a client can identify foods that they could swap out as part of their transition. No one else can suggest what is right for you, though, or tell you when the right time is for you. I remember when, years ago, a healthy-eating friend suggested that I eat nuts instead of chocolate – all I could see was some barren wasteland of a dull, boring life. There was no way I was ready for that at the time and it was only several years later that I knew I was ready to make a change to my excessive chocolate and cake consumption — and do it my way. My transition to primal-aligned eating seemed to be an ‘in at the deep end’ kind of thing – I just took the plunge and never looked back. I see myself as an ‘all or nothing’ kind of person. And yet, looking back, I didn’t really do it like that. I gave up the obviously sugar-heavy foods first (desserts and milk chocolate) and then, around two years later, ditched the hidden-sugar foods: the starches and processed foods. 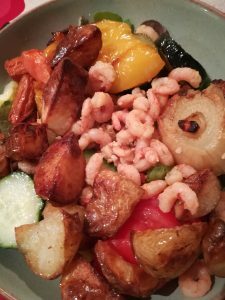 I suppose that not having to give up everything at once made it easier – some people go through the ‘low-carb flu’ when they do it fast – and yet I do now wish that I had known sooner that some of the things I was filling up on were not really helping me (huge bowls of fruit salad, muesli, brown rice, lentil soup). We all have to find our own way. For me, constructing my own framework of eating works well – once I have decided what I can and cannot eat, I appreciate the clarity and know that if I stick within my own guidelines, I can relax and enjoy the food. There’s no need to be continually making decisions; the decisions are made and I just work within that. People who write about willpower would probably say that I am helping myself to avoid willpower fatigue. Our willpower seems to have limits and if we keep having to use it too much, we wear it out and end up with much weaker willpower by the end of the day. Of course, the nature of primal-aligned foods also means that willpower is not really as big a deal as it sounds: for a start, I never need to be hungry. The foods score quite high on satiety due to the effect they have on hormones; they also taste and feel great. And while filling foods that don’t cause blood sugar swings mean less need for sweet treats, I’ve found a whole world of substitutes for milk chocolate whenever treats are needed (and when feeding children, I believe good healthy treats are definitely needed), including very dark chocolate (85% cocoa), strawberries and cream, full-fat yoghurt, macademia nuts, coconut butter, and various home-made primal-adapted ice cream/pancake/cookie recipes. The other reason I see myself as an all-or-nothing kind of person is that I have never been very good at moderation. One piece of cake, one crisp, one bite of a Mars bar and then no ability to refrain from having more. I like food. So, the 80/20 rule works really well for people I know but it just isn’t for me in my day-to-day eating. I like my ‘rules’ and I feel comfortable within them. Where I do use 80/20, though, is when it comes to particular foods that don’t come up all the time but which I want to be able to enjoy. For example, a speciality food from the country or region where I am on holiday – paella in Spain, even though I don’t normally base my meals on a plate full of rice, a Cornish pasty from my favourite farm shop in Cornwall, even though I wouldn’t normally touch wheat. Like other people in the primal/paleo/ancestral-health world, I use primal-approved ingredients to adapt favourite recipes: ground almond instead of flour, butter instead of margarine/industrially-produced vegetable oil, etc. But there are just some foods that I want to be able to enjoy whole-heartedly, just not that often: proper Italian pizza comes to mind. A couple of times a year is fine and, although the wheat does affect me, I can tolerate it enough and enjoy a great family night out. There are all kinds of primal/paleo adaptations, from cauliflower pizza base to no base at all (yes I do do this sometimes) but, for me, being able to enjoy a good-quality regional speciality fits perfectly well into the mindset of primal-aligned living. And this is where we come to ‘cheat foods’ or ‘cheat days’. 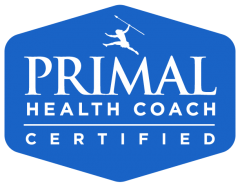 Primal health just doesn’t do the concept of cheating – write your own rules, allow into your own framework the foods or meals that you really don’t want to miss out on and think about how often you are likely to have them. If you’re finding that the whole framework is becoming full of non-primal-approved foods, then of course this won’t be a primal lifestyle any more and you can either decide that primal isn’t for you or you can work on swapping some foods or meals around to get back to 80/20. But if you are creating your own way of living, accept that some foods (and experiences) will be a part of your landscape for very good reasons. Enjoy them, never feel guilty, and know that your overall eating is good enough to accommodate them. If you have any tips and tricks and thoughts on these things, do write them below in the comment section.